Are you working with an Oracle database and looking for a PL/SQL tool? Well look no further, Allround Automations has the one and only tool you need named PL/SQL Developer. If you work with an Oracle database then PL/SQL Developer from Allround Automations is a tool that is a must have. This product can be used by those who have minimal experience working with a database and also will be very useful for seasoned professionals. 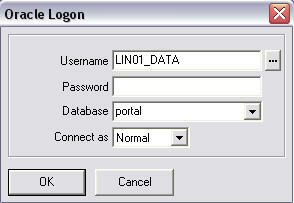 Once PL/SQL Developer is installed and you execute the application you will then be presented a logon screen. Select the database instance you wish to interact with and click ‘OK’. Once you have logged in you are presented the following screen and all the wonderful features available in this product. As you can see every conceivable object is available at your finger tips. As a developer the objects that I utilize on a daily basis is 'Tables' and 'Procedures'. The interface provide make it quick and painless for me to query, update, delete, and insert data. A feature that I found to be invaluable is the Project feature. 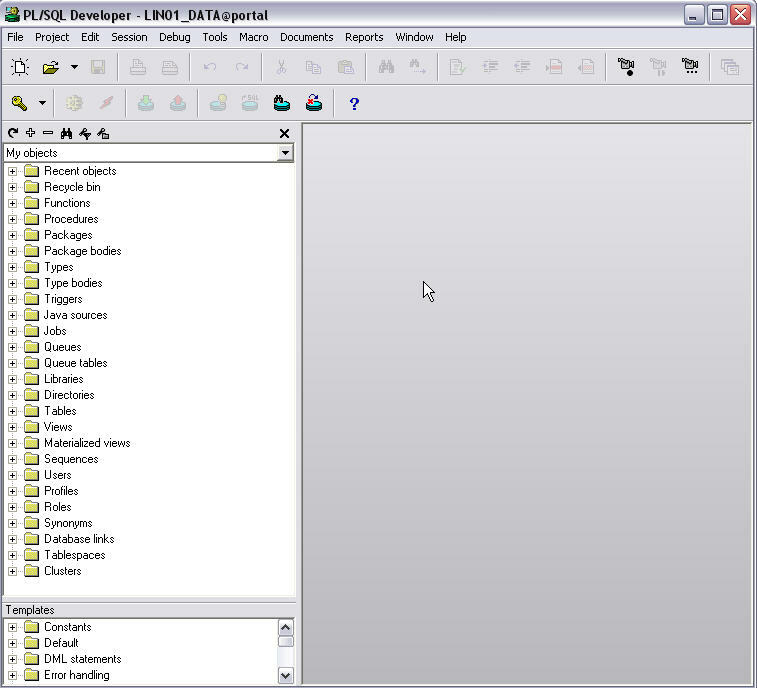 To organize your work you can use PL/SQL Developer’s project component. A project consists of a collection of source files that you have been working with which can be anything from a SQL Script, Procedure, Function, and Trigger just to name a few. This provides you the ability to work with an exact set of items. The beauty of this feature is no longer do you have to search for a specific piece of database code and as well using the project component provides the ability to share your work with other developer or database administrators. Another great feature with PL/SQL Developer is the TODO component. 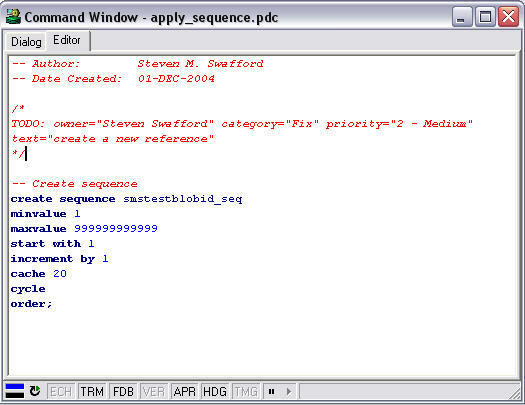 As you are working within a SQL Script for example you may right click add select the TODO option. This will bring up the following window. Once you have entered the required information you script will have a TODO annotation which will look similar to the following. There are so many outstanding features available that I do not have the time to cover each and every one of them. Here are just a few that I will touch on (be sure to look at PL/SQL Developer’s product page for a detailed listing). To optimize the SQL statements in your program units, Oracle's Explain Plan utility can be a big help by showing the execution path of a statement. To use Oracle's Explain Plan utility, press the ‘New’ button on the toolbar and select Explain Plan Window. There are a number of standard reports, and you can easily create your own custom reports. These custom reports can be saved in a report file, which can in turn be included in the reports menu. Finally, the last feature I will discuss is the code assistant. As you type the name of the procedure you are working with, the list will be reduced. If for example you type an r after dbms_alert., only the register, remove and removeall procedures will still be present in the list. As you are probably already aware of this type of feature can clearly provide you a means of quickly locating a procedure in this case you wish to utilize. Where the default features of PL/SQL Developer may fall short, in walks the free plugins. I installed a few of these plugins which I found to be interesting and I found that I could make the most steps I perform a snap. Assuming the available plugins don't fill your need, if you have someone that can create a DLL, you can write your own plugin to extend PL/SQL Developer as well the API is straightforward. As a developer who has worked with Oracle databases for the last few years, I for one absolutely recommend PL/SQL Developer as the IDE of choice for interfacing with an Oracle database. Please take a moment to watch a video clip that demonstrates how easy it is to create a table, sequences, and to query data. Be sure to download the demo version and test drive this wonderful tool for yourself and if you decide to purchase the product, be sure to tell them you learned of this product from ASPAlliance.